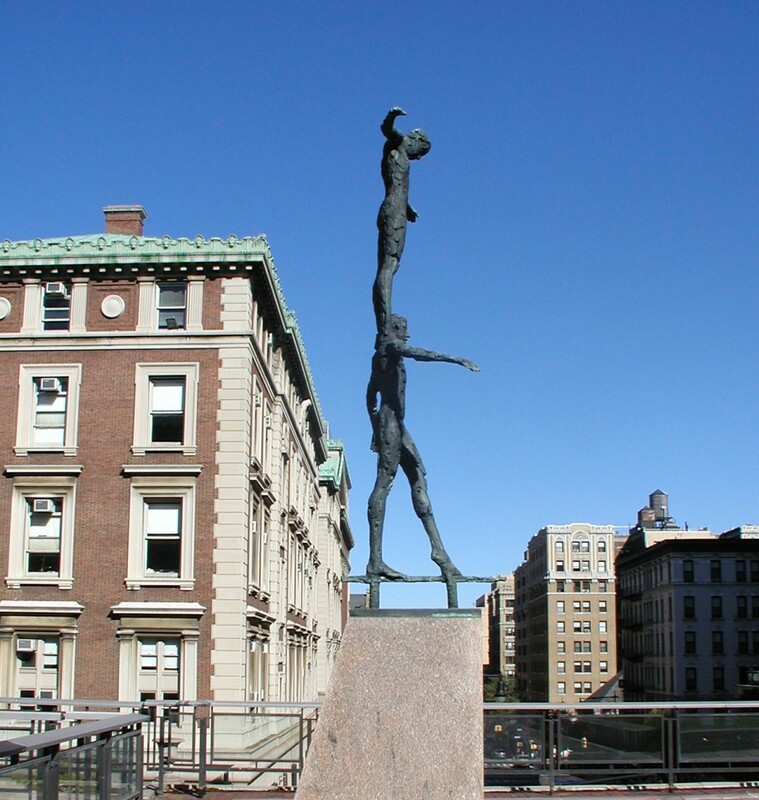 Crossing the sky bridge over Amsterdam Ave. and walking toward Columbia University’s Law School, visitors quickly see a towering bronze sculpture depicting two tightrope walkers, one balancing atop the other’s shoulders. Created as a tribute to General William J. 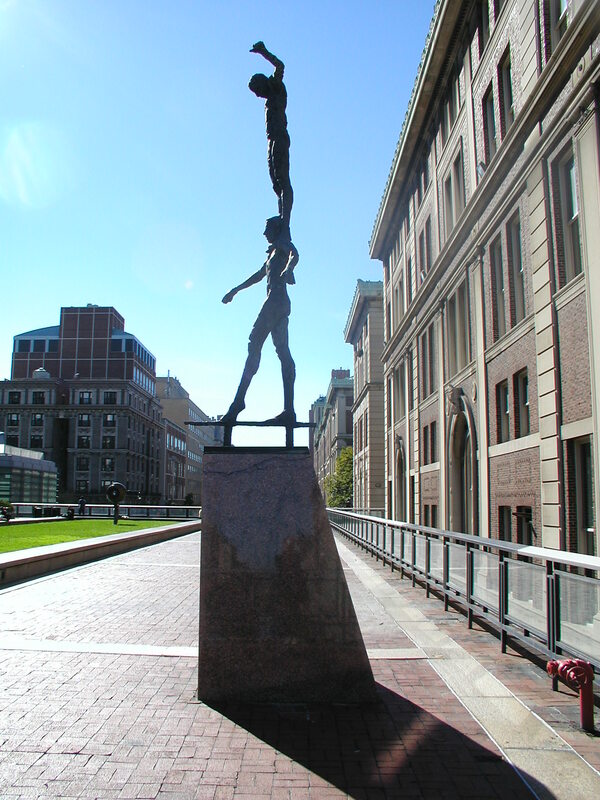 (“Wild Bill”) Donovan, a graduate of Columbia College and Columbia Law School, Tightrope Walker was created by the Dutch artist Kees Verkade and installed on Revson Plaza in 1979. Born in 1883, Gen. Donovan came to prominence as the commander of New York’s “Fighting 69th” regiment in the First World War. He became the only soldier who fought in that war to receive the four highest awards: the Medal of Honor, the Distinguished Service Cross, the Distinguished Service Medal, and the National Security Medal. During World War II, Gen. Donovan served as the wartime head of the Office of Strategic Services, a precursor to the Central Intelligence Agency. 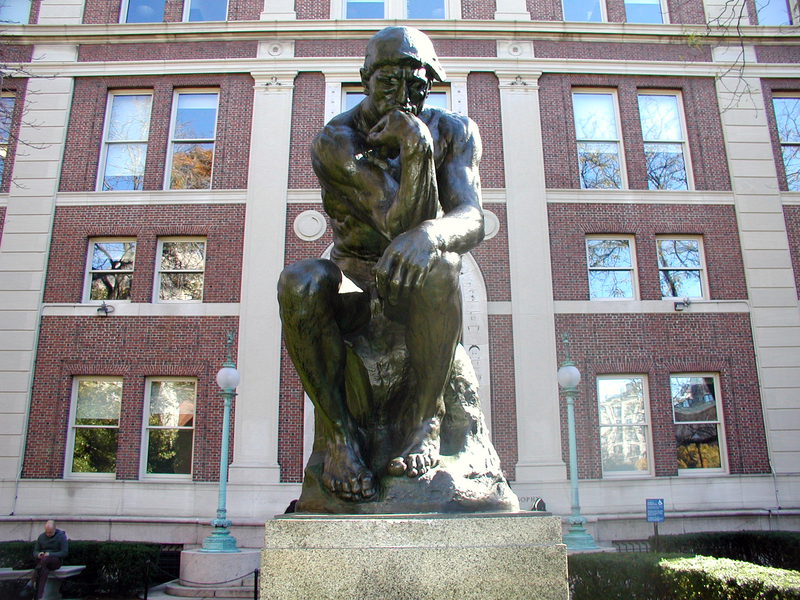 He died in 1959 and, ten years later, a group of the General’s associates and friends began fundraising to create a memorial to commemorate him, to be located on Columbia University’s Morningside campus. 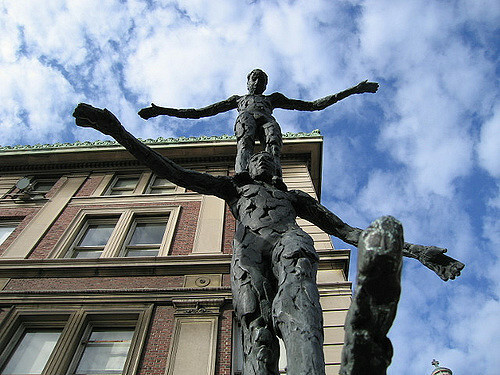 The sculptor Verkade was born in Haarlem, The Netherlands, in 1941. He trained as a sculptor from the age of sixteen, when he enrolled at the Royal Academy in The Hague. During his five years of training, Verkade was introduced to the details of bronze casting, a medium that would define his future work. By 1970, his art had gained international attention when an article about him appeared in Time magazine. 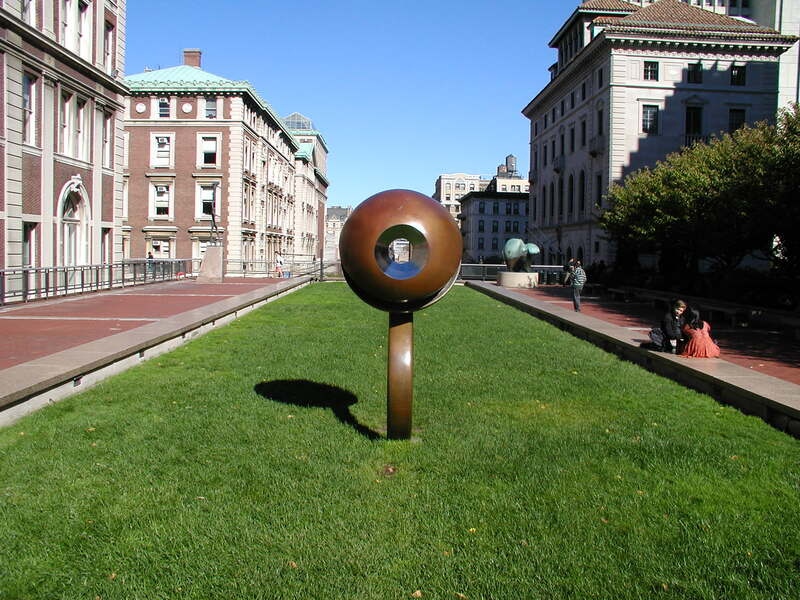 Soon afterward, in 1973, he was commissioned to design the sculpture honoring Gen. Donovan. 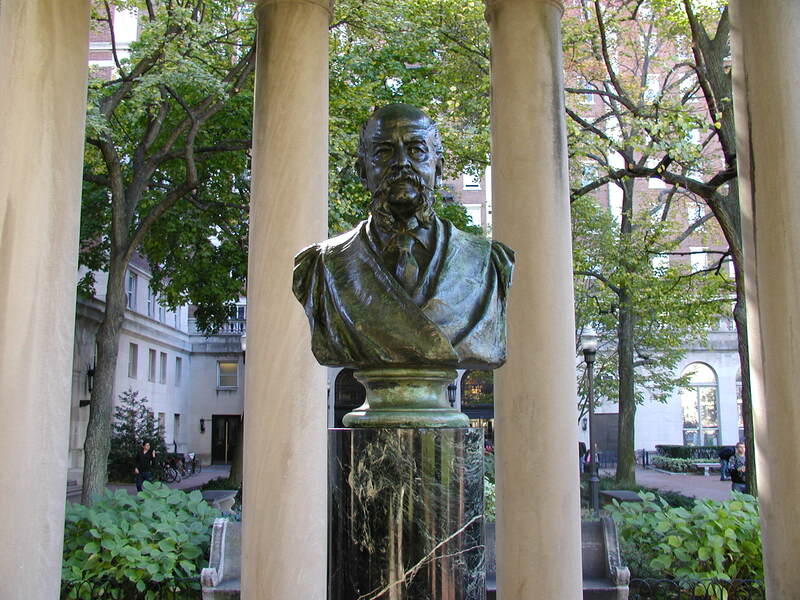 In preparation for the memorial, Verkade watched archival films of the General and interviewed people who had known him in order to become more familiar with the man. In choosing to depict two tightrope walkers, one balancing upon the shoulders of the other, Verkade wanted to display the courage and controlled daring of Gen. Donovan. 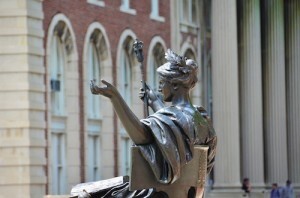 The bronze sculpture, installed on Columbia University’s Revson Plaza, weighs 842 pounds and stands 14 ft. 3 in. 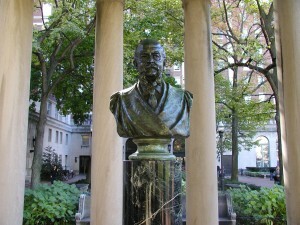 tall, not including its plinth, which makes the monumental sculpture reach a height of 21 ft.
Verkade is also famous for his bust of Princess Grace of Monaco, an example of which is in the collection of the National Portrait Gallery, Smithsonian Institution, Washington, D.C. To learn more about Verkade, go to http://www.keesverkade.com/en. This entry was posted in Morningside and tagged AP photos, Kees Verkade, Tight Rope Walkers on December 16, 2014 by Roberto Ferrari.